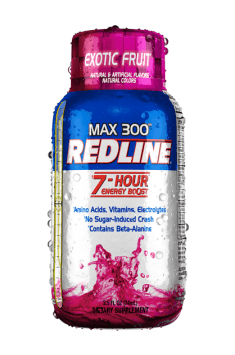 VPX Redline Max 300 is an intensive pre-workout supplement closed in the form of a comfortable shot. It constitutes a powerful energy boost for the toughest training sessions and we may take it with us in a pocket. Niacin – also called vitamin B3, appears in the supplement in the form of niacinamide. It takes part in the processes aiming at deriving energy by the organism from the provided nutritional substances. It also has positive influence on the functioning of the nervous system. It is conducive to positive emotional states and is indicated as a form of prophylaxis of depression. Niacin also supports the health of the circulatory system, as it has the ability to optimize lipid profile. There are also certain premises, indicating that vitamin B3 stimulates the functions of the immune system. Vitamin B6 – this vitamin is equally vital due to its influence on energy balance of the organism, essential for efficient energy intake from the provided nutrients. It regulates the processes of glycogenesis and glycogenolysis, conditioning proper supply of nutritional substrates in muscle tissue. It also supports the functioning of the circulatory system, having influence on blood pressure. Vitamin B6 also influences the functions of the nervous system, may stimulate cognitive abilities and prevent depression. Folic acid – importantly, in the preparation it appears in the form of folates, therefore its biologically most active form. The preparation is a great choice for people dealing with the problems with methylation. As for this process, folates also take part in the reaction of converting homocysteine to methionine. Folic acid also positively influences the functioning of the central nervous system and stimulates the development of neural tube in the fetus. It is also essential for the proper DNA metabolism. Folates also take part in the process of red cell production. Vitamin B12 – contained in the preparation in its most bioavailable, methylated form of cobalamin. It plays incredibly important role in the process of methylation, conditioning at the same time the efficiency of energy processes in the organism. It is a coenzyme in the reactions of methylation of homocysteine to methionine and transforming methyl-malonyl-CoA to succinyl-CoA. It also plays an important role in erythropoiesis, conditioning proper production and maturation of red cells. Vitamin B12 also takes part in the production of myelin sheath, thanks to which it has positive influence on the functions of the nervous system. Complex of electrolytes – the preparation secures the organism from deregulation of water-electrolyte balance, which leads to the drop of physical efficiency, by providing mineral ions, conditioning proper osmolarity of bodily fluids. During intensive physical effort we lose precious electrolytes with sweat, deregulating water balance in the organism. Its disorders lead to the drop of metabolic efficiency of all cells in the organism. Sodium and potassium are the main ions deciding about the osmotic balance at both sides of cell membranes, additionally conditioning the production of ATP in the sodium-potassium pump. For the proper activity of ATPase also magnesium ions are essential, which are also contained in the supplement. Moreover, in the composition of the product we will find calcium, which in the ionized form is essential to engage motor entities of skeletal muscles. Caffeine anhydrous – a popular substance used in order to reduce the symptoms of fatigue and for intensive stimulation. It is a competitive inhibitor of adenosine, which means that it binds with its receptors, without activating them. In this way, it limits the ability of adenosine to bind with them and its characteristic signalization, thanks to which it carries information about fatigue. In this way, caffeine reduces the symptoms of fatigue. Stimulating effect of this substance is also obtained thanks to the fact that it is a competitive inhibitor of cAMP phosphodiesterase, thanks to which it stimulates the concentration of cAMP in cells. In this way, it increases the effectiveness of adrenaline, stimulating the organism. N-acetyl-L-tyrosine – acetylated form of tyrosine, an amino acid, which is a precursor of many important hormones and neurotransmitters, stimulating effort abilities of the organism. It enters the pathway of dopamine synthesis, which is responsible for proper neuromotor coordination and also is conducive to maintaining good mood, promotes cognitive abilities and stimulates the center of motivation. Tyrosine is also a precursor of adrenaline and noradrenaline, hormones aiming at introducing the organism in the state of increased alertness and stimulation. Tyrosine may also influence metabolism, taking part in the production of thyroxin and triiodothyronine. Beta-Alanine – is a carnosine precursor, a compound playing a role of intercellular buffer of acid-base environment, thanks to which it slows down pain in muscles, which limits physical efficiency. Such a mechanism of carnosine is based on its ability to neutralize the influence of lactic acid, which by decreasing pH in intensively working skeletal muscles limits their efficiency. Optimization of acid-base environment is also conducive to post-workout regeneration processes. Summing up, VPX Redline Max 300 is a pre-workout shot ensuring maximization of effort abilities and strong stimulation. It allows to beat lack of motivation to perform an intensive training, generating larger stimuli for development. 1 bottle about half an hour before workout. In case of people sensitive to the effect of stimulants, the content of the bottle may be treated as two portions. The half of the shot should bring a desired effect for people who rarely use pre-workouts. Due to the high content of caffeine, do not use the product in the afternoon to avoid sleep problems. VPX SPORTS is one of the leading manufacturers of diet supplements and sports nutrition. In the wide offer of the company an important place have high-quality protein-carbohydrate supplements that speed up the building of muscle tissue. Brand is also known for the production of pre-workout supplements that stimulate the body and increase the endurance of an athlete, which allows you to achieve much better results. Among the VPX SPORTS products there can be also be found supplements speeding up the fat burning, also with the multi-phase action. The company is known for its innovative solutions, including the introduction to the market the first CMF protein. Dietary supplement that supports the proper joint function. It positively influences psychological well-being; supports the health of the osteoarticular system.